The project we discuss here suggests that young school children can acquire literate practices that combine production, design, and communication in a variety of modes, through a range of media, and further, that such practices can connect them with community members about matters of immediate significance. The children, assisted by their teacher, became part of the material and discursive practices associated with an urban renewal project. Our point here is not to suggest that teachers should be looking for causes to promote or that critical literacy practices can always be fully aligned with children’s out of school lives but that similar opportunities may present themselves to explore why things are the way they are, if and when teachers are alert to children’s questions about changes—in everyday life, local communities and workplaces—that affect families. In the classroom program we describe, the teacher is developing critical literacies that are materially as well as textually practiced—it is action involving language, body, and place, and perhaps there are lessons here for the design of critical literacy curricula. Marg Wells’s class was a mixed grade 2/3 class. The children brought with them a range of cultural life-world experience and knowledge. Some of their parents came to Australia as refugees from Vietnam and Cambodia, others were of Middle Eastern and Eastern European cultural heritage. Within the language and cultural groups in the class, there were further differences of religion, parental education, rural and urban locations, connections to homelands, networks of commerce, and webs of politics. The classroom can, on one hand, be seen as a microcosm of Australian differences, but, on the other hand, all the children’s families live on an economically tenuous terrain. … They either depend on welfare payments or make do as best they can in part-time, casual, and poorly paid jobs and struggling small businesses. Many children live in female-headed households and have experienced the pain of family fracture and dislocation, but most of these single mothers have established themselves in new friendship networks in which the school has played a significant part—it is a community meeting place. There are a lot of worried parents in the area, especially now with the vacant houses, the so-called vacant houses in the area—they’ve got squatters in them, there are houses that are having things pinched off them, and fences pulled down and fires started in there. It’s really scary. It’s because it’s in-between; they won’t do the places up, they won’t put their money in, they’re just emptying them … and yet the project, the redevelopment hasn’t got the go ahead, so they’re not knocking them down and building others. It just wouldn’t happen in other areas. study in their classroom. A team of teachers, including Marg, rather than ignoring or commiserating with the students’ circumstances, helped them explore and contribute to the urban renewal project through their involvement in the literacy and social power unit. whether they thought young people had the power to change things. These questions invited the children to move from the personal, to the local, to the global; to make evaluations and imagine what might be changed; and to consider whether young people have the power to change things. This sequence of directed thought, reflection, and imagining from the situated, specific, and local to the more abstract, imagined, hypothetical, and global is, we believe, important to note. 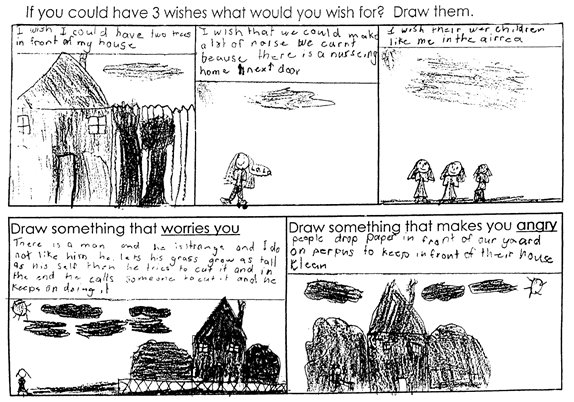 In this classroom, Marg designed an assignment that asked the children to represent their thinking through drawing three wishes, something that worried them, and something that made them angry. The children were required to write captions explaining their drawings. Their products reflected their interest in their neighborhood and their emerging understandings of themselves in relation to the people in the neighborhood. We discuss one response in some detail in order to illustrate what the children did with this task … . Along with the three pictures of her wishes … , the child’s written captions deal with her relationship to the neighborhood practices of the community—to trees in front of her house, the need to be quiet in consideration of her elderly next-door neighbors, and the desire to have children like herself living nearby. Her writing and drawing suggest how she conceptualizes significant elements of her world. They raise questions too about who she perceives as being like her. We can guess that these may be oblique references to race, ethnicity, and gender because her picture depicts three girls standing together in the foreground. Significantly, what we do know is that she already perceives of herself as different from other children who live in the area. Thus, her representations of her wishes are related to how she experiences identity, citizenship, and locality in her everyday life. Marg decided to take up these concerns and work with them. She reworked her curriculum so that the children could begin actively to research the issues they had raised in their discussions, drawing, and writing. The classroom became a place where children could learn about their neighborhood and the plans for its “renewal” differently. The teacher makes available, models, and directs a new range of discursive resources in the context of children becoming engaged in local action. Literacy lessons are hijacked for real-world learning and action. These children, as we will see, do not simply learn letter writing as a genre, or how to write and send a fax, or how to read a map, in case they need these skills one day. They learn these forms of literacy as social practices that are part of everyday life, in the here and now, part of living in a particular community and attending a particular school. Children in many classrooms are invited to voice their concerns about contemporary life, though we suspect it is less common in the early childhood years of schooling. Less frequent too, we suspect, is teachers taking up and using children’s analyses as a starting point for further inquiry and curriculum design. In Marg’s classroom many children made their concerns evident about the poor condition and low numbers of trees and parks in their neighborhood. Clearly they had been influenced by their peer discussions because similar points (about trees, dogs, rubbish) were made across the students’ artifacts. It is important to know that in South Australia, the driest state in the driest continent, trees cannot be taken for granted. Residents pay high water rates. Indeed, the more affluent suburbs are often euphemistically described as the “leafy suburbs”; the condition and quantity of trees can be considered as an ad hoc social class marker. These children were learning how to conduct research and how to use information and communication genres and technologies in context. Having voiced their concerns about the condition of the trees, they went on to understand (in part) how the problem had eventuated and what could be done about it. They redesigned the local reserve as they would like to see it and sent their labeled diagrams and drawings to the people in charge of the urban renewal project.